November 28, 2018. Out of the original 17 semi-finalists, DexMat was selected as one of 5 finalists to pitch at the 2018 SpaceCom Entrepreneur Summit in Houston, TX, for the opportunity to win the $100,000 Entrepreneur Challenge. As a runner-up, DexMat won $20,000 in Google Cloud Credits. Click here for more information on the SpaceCom Entrepreneur Summit. HOUSTON – SpaceCom – The Space Commerce Conference and Exposition, where NASA, aerospace and industry come together to connect, announces the finalists of the SpaceCom Entrepreneur Challenge. Taking place at the George R. Brown Convention Center in Houston November 27-28, this challenge is the culmination of the SpaceCom Entrepreneur Summit (SES). The Entrepreneur Challenge began with 56 startup applicants. Through the first round of judging, that number was narrowed to 23 and now 17 semi-finalists who will present during the first day of the SpaceCom Entrepreneur Summit, Tuesday, November 27. Last month we had the opportunity to show off our carbon nanotube yarns and films at the IdTechEx conference in Santa Clara, CA. In this video, Dmitri describes the various materials and applications that we spoke about at our booth. It was a great show, and we are excited to return to other IdTechEx events in the future! This video highlights the high temperature stability of CNT yarns compared to copper wire by applying a 1430 C butane torch to both materials. The copper wire lasts about 5 seconds before melting, while the CNT yarn survives the torch for more than 30 seconds without any visible damage. The high thermal stability and superior thermal conductivity of the CNT material is most likely the reason that it is able to survive exposure to the flame from the torch. The impressive thermal properties of CNT fibers and films make them highly promising for application in flame retardant materials such as those used in firefighter suits. https://dexmat.com/wp-content/uploads/2018/11/cnt-vs-copper-thumbnail-1.png 802 1436 Dmitri Tsentalovich https://dexmat.wpengine.com/wp-content/uploads/2018/07/dexmatlogov2web-noshadow.png Dmitri Tsentalovich2018-11-07 00:03:592019-01-03 16:42:49DexMat Carbon Nanotube Yarn: Will it Burn? Source: Original article appears in the October 2018 issue of the Wire Journal International. Free subscription is required to read the digital version of the article. The feature on DexMat is on pages 52-53. Abstract: The above video demonstrates how carbon nanotube fibers are integrated into a spacesuit to help spacesuits mitigate dust contamination for future lunar and Mars missions.The spacesuit fabrication and testing was performed by researchers from the University of North Dakota, Boeing, and the NASA Glenn Research Center. CNT fibers were produced by DexMat. Spacesuit dust mitigation has been a topic of high relevance and a critical path for future planetary exploration missions including Moon, Mars and Asteroids. A previous study demonstrated utilizing Carbon Nanotube (CNT) yarns as electrodes embedded into coupons made of spacesuit outer-layer material. When a multiphase Alternating Current (AC) voltage signal was applied to this material, the spacesuit fabric repelled greater than 80% lunar dust simulant with particle sizes between 10-75m in ambient conditions. As a continuation to this study, the feasibility of scaling the CNT embedded dust removal system on larger portions of spacesuit is investigated. A scaled prototype, representative of the knee joint section of a planetary spacesuit utilizing specifics of the NDX-2 lunar spacesuit developed by University of North Dakota was constructed. The outer-layer of this prototype is embedded with the CNT dust removal system and tested under various conditions. Fabrication of this system and results from the experiments using lunar dust simulant are detailed in this paper. (Nanowerk News) Ingested or injected pharmaceuticals can target specific molecules involved in disease processes, but get distributed throughout the body where they can cause unwanted side effects. An approach known as electroceuticals aims to avoid systemic exposure by using small wires to electrically monitor and manipulate individual nerves that control organ function and carry information about disease. Despite the promise of electroceuticals, it has been challenging to develop long-term therapies due to the lack of biocompatible wires. Now, NIBIB-funded researches have spun carbon nanotubes into flexible, nerve-sized wires or yarns capable of high-fidelity long-term connections in live animals. The development of these biocompatible yarns opens the possibility of new bioelectric diagnostics and therapies through regulation of internal organ function at the single nerve level. All the organs of the body such as the heart, lungs, liver, and kidneys are automatically controlled by nerves that stretch from the brainstem to each organ. These nerves control organ functions such as heartbeat, breathing rates, and blood pressure, making constant adjustments in response to environmental and physiological changes. Variations in the electrical activity in this area of the brain, known as the autonomic nervous system, can also be predictors, indicators or causes of disease development. 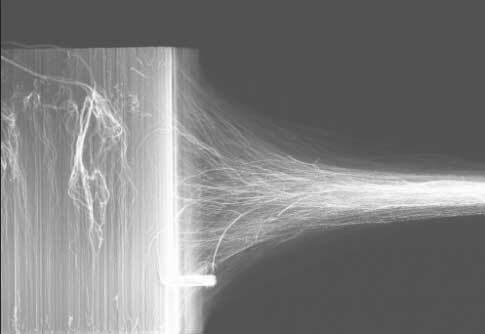 In a study reported in the journal Scientific Reports (“Chronic interfacing with the autonomic nervous system using carbon nanotube (CNT) yarn electrodes”), bioengineers at Case Western Reserve University in Cleveland, Ohio describe the development of highly flexible carbon nanotube (CNT) yarn electrodes that were capable of months-long electrical recording in major nerves of the autonomic nervous system in rats. The CNT yarns are essentially, just that, yarns made from a “forest” of hundreds of carbon nanotubes that are pulled from the metal surface they are grown on and spun into a highly flexible, highly conductive wire 1/100th the size of a human hair. Current technologies for recording electrical signals from nerves include relatively large stiff tungsten needles used by neurologists to obtain readings from single nerves of patients for several hours, but must be removed before causing lasting nerve damage. 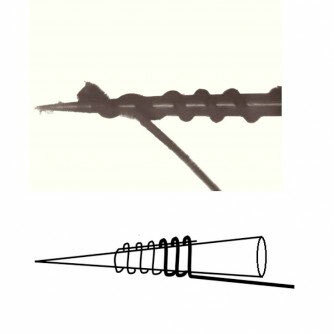 Other wire electrode technologies can record nerve signals for short periods but because of their dimensions and stiff mechanical properties they are not suitable for long-term recording in small nerves. The combination of the biocompatibility of the CNT yarns and their outstanding ability to carry an electrical signal that is 10 times stronger than current technologies makes them ideal for long term recording of specific nerve signals. Finally, the lack of nerve damage keeps the surrounding axons intact, which helps to eliminate background noise. Thus, the CNT yarns have an excellent signal to noise ratio (SNR), which is critical for this type of research. The group tested the CNT yarns in two major nerves in the autonomic system in rats. One study involved the vagus nerve, which stretches throughout the body to connect to numerous organs. The nerve is known to control and monitor a range of functions including heart rate, digestive tract movement, sweating, and immune response. 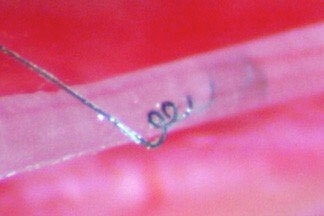 CNT yarn electrodes were also inserted into the glossopharyngeal nerve. The nerve is connected to a number of organs including the carotid artery, and parts of the ear, tongue and salivary glands where it is known to be involved in swallowing. In both nerves, recordings of stable electrical activity were maintained over a 10-week period. Pulses of nerve activity were also monitored while the animal responded to physiological challenges. The challenges included distension of the rat’s stomach with saline solution, and short durations where the rats were in low oxygen environments. In each case, the physiological changes induced by the challenge resulted in easily detectable changes in electrical activity that were recorded using the CNT yarn implants over the entire 10-week period of the experiments. Durand explains that the goal is to learn what electrical signatures or profiles are indicative of disease development and to use that for early intervention, potentially by electrical stimulation or even blocking of the nerve. For example, one therapy for severe hypertension is the cutting of the renal nerve. This is obviously irreversible. Durand, explained that CNT yarn electrodes could be used to block the nerve impulse without cutting the nerve, making the treatment reversible. The group is also excited about the potential of this recording method to improve prosthetics. “When an arm has been amputated there are tens of thousands of neurons remaining,” said Durand. “The approach would be to insert the CNT yarns into individual nerves and record the electrical signals that are created as the individual thinks about moving the missing arm—essentially learning the electrical signals that are formed by the intention to move the arm.” The ultimate goal is to develop neural interfaces capable of translating those electrical signals into better control of the prosthetic by the user.